Wedding Party Bus rental or Limousine rental for your special wedding day? This was not really a question in years past as the types of busses used for today’s conversions into a beautiful and luxurious form of transportation were almost unheard of. Today’s Party Bus Rentals like the one’s used by Varsity Limousine Services and produced by Tiffany just plain set the standard in safely and in luxurious appointments. The traditional Wedding Limousine just can’t match today’s standard of luxury and convenience set by a wedding party bus. No need to worry about crawling over the seats and wrinkling dresses and suits- specifically the bride’s dress. The wedding party can gracefully walk up the stairs to enter the party bus, pause, turn around and wave for some more photos and continue onto the party bus while standing up and choosing the perfect seat. Another big advantage of a party bus rental for your wedding over renting a limousine is the pure capacity advantages. The seating capacity of a party bus- especially with today’s wedding parties getting larger and larger- can’t be matched by a limousine. 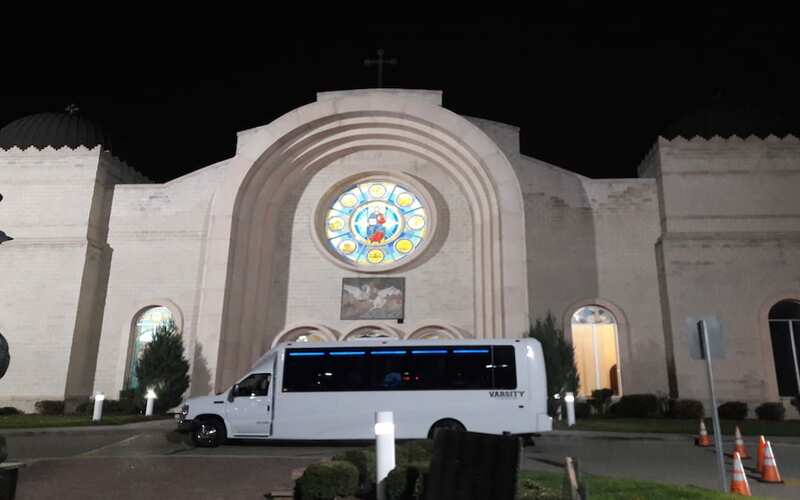 Even if you had the maximum number of passengers cramped into a limousine, and transferred them to one of Varsity Limousine’s Wedding Party Bus Rentals- there would still be PLENTY of room for more passengers, let alone having the room to spread out and relax. You’ll be so proud on your wedding day to see the look on everyone’s faces as you pull up in a luxury party bus, and the red carpet rolls out for you and your wedding party to walk out like royalty. Check out our party bus rental fleet and view other limo transportation options for groups large and small- visit our Party Bus and Limo Fleet for your Wedding plan page today for a Red Wings game experience you’ll never forget!